FOX Sports Midwest is in its 22nd season as the television home of St. Louis Blues hockey. FOX Sports Midwest will televise 72 regular-season Blues games in 2018-19, with the remaining 10 carried by the NHL’s national TV partners. The 2018-19 Blues TV schedule can be found HERE. FOX Sports Midwest also airs the Blues Live pregame and postgame shows before and after each of its telecasts. During the Stanley Cup playoffs, FOX Sports Midwest carries select first-round games and produces postgame shows after every Blues playoff game. FOX Sports Midwest’s Blues telecasts are available in Missouri, central and southern Illinois, Kansas City, Iowa and Indiana. For more information, e-mail midwest@foxsports.net. If you are a customer of a participating pay-TV provider, you can stream FOX Sports Midwest’s Blues telecasts on the FOX Sports app. For more info, click HERE. Blues telecasts air on FOX Sports Indiana. If the Blues and Indiana Pacers play at the same time on FOX Sports Indiana, both games will be shown, with the Pacers appearing on the primary FOX Sports Indiana channel and the Blues game on an alternate channel that is often labeled FOX Sports Plus. Blues games are available on FOX Sports Kansas City in the Kansas City market. If the Blues play at the same time as the Kansas City Royals, Sporting Kansas City or Kansas State on FOX Sports Kansas City, both games will be shown, with the Royals, Sporting KC or K-State appearing on the primary FOX Sports Kansas City channel and the Blues game on an alternate channel that is often labeled FOX Sports Plus. 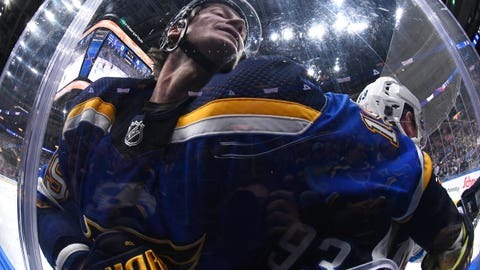 Blues games are available within the NHL-designated Blues TV territory on satellite and telco providers including DirecTV (channel 671), Dish Network (channel 418 or 412-08) and AT&T U-Verse (channel 748 and 1748). Check with your provider or e-mail midwest@foxsports.net for more information. FOX Sports Midwest is also available on live streaming TV services including Hulu with Live TV, YouTube TV, FuboTV, DirecTV Now, Sling TV and PlayStation Vue. Blues telecasts are available on FOX Sports Midwest within the Blues TV territory. Contact your provider for more information. The NHL designates geographic territories to which each team can show its regionally televised games. The areas listed above are within the Blues TV territory. Blues fans outside the Blues TV territory may wish to view games via the NHL Center Ice out-of-market TV package or via NHL.TV. For NHL.TV blackout information, click HERE.